The match "NDF Carabinieri vs Poly Blues" scheduled for the Friday 17 June did not take place due to a miscommunication between the KBA officials and the KBA apologises for that herewith. That game will be rescheduled according to the availability of the teams involved in a later stage, before the beggining of the 2nd leg. 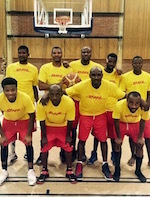 The National Champions Civics Suns showed to be weaker than their rivals, the Tomahawks MBA when they went down by 5 points during their first encounter in the 2005 Basketball Season. Tomahawks' Luis Almeida (SF) showed court supremacy when in the 3rd quarter his teammate Lyniando Murere (C) was fouled out, although Tomahawks most dangerous weapon Paulo Cassanga (PF) was unstoppable. On the Suns side, their most precious player Mpume Hlabangana seemed desperate to win the game what took him to force unnecessary shots that reduced his above 60% FG% to alower than 40% FG%. The Suns took their only lead of the game on on the 3rd quarter for only 3 minutes, trailling for the rest of the game. Paulo Cassanga was the best scorer for the T'Hawks with 32 points, followed by the "MAN OF THE MATCH" Luis Almeida with 21 points and Freddy Amushendje with 20 points. On the Suns side, Mpume Hlabangana scored 29 points followed by Eric Norman with 22 points and Coulson Jackson with 15 points. The match between the Titans and the Rebels was quite personal as the Rebels took the lead in the first quarter, never looking back again. The Titans lost the game on free throws (Rebels had 23 points from FT) as the only 5 present Rebels managed to stay safe from the fouls. Rebels' Brian Hore had a couple of dunks of which one was a two-handed powerslam on Titans' Ruben Iyambo A.K.A. 7. On Rebels' side, Nigel Mubita was the best scorer with 21 points, followed by Brian Hore with 20 points (including 4 3pt) and Mao Mpoyi with 18 points. Titans' Ruben Iyambo scored 16 points, followed by Nawa M with 14 and Paulus H (Homzak) with 11 (3 3pt).